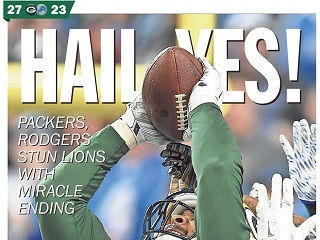 On the front pages of more than half a dozen Wisconsin dailies today, the headline says it all. Not since the famous pass-it call by Pete Carroll in the Super Bowl has there been such a wacky, game-ending sequence. Thanks to a smidgen of a face mask, Aaron Rodgers got to try one last heave and miracle of miracles, he won the game and kept his Packers a game ahead of Carroll’s Seahawks in the NFC Wild Card race. Also bannering the above headline today are sister Gannett properties the Marshfield News-Herald, the Stevens Point Journal, The Reporter, The Wausau Daily Herald, The Sheboygan Press, The Post-Crescent, The Green Bay Press-Gazette, The Daily Tribune and the Herald Times Reporter.